Similar to all natural forests, there are certain seasons and cycles when fruit is more abundant than others. During this particular time of the year fruit in Bukit Batikap is less abundant and like wild orangutans, our orangutans are already adapting and consuming other food types found in the forest, such as termites and the inner stems of rattans and gingers. Others are resting for long periods, conserving energy, whilst some adventurous orangutans have roamed far north to Bukit Monnu where fruit is more abundant and many orangutans have congregated. The monitoring team have stretched their working range to the furthest approachable points to obtain radio tracking signals to confirm orangutan presence and distribution. Bukit Monnu is 2 hours by boat from our main camp, and we only have a very basic hut here, but we try and spend as much time here as possible to observe our orangutans. Read further for the update reports from the Monitoring Team in Batikap on some of the orangutans they successfully tracked and observed. Isis who was released in February 2013 still focuses her activities around her release point. Unlike most orangutans in Batikap, at times of fruit shortage like now, Isis doesn’t put any effort into looking for food in Bukit Monnu. The Monitoring team have found her to be very skilful in looking for alternative foods such as termites, ants and tree-barks. Isis looks healthy and ignores the monitoring team in general, although sometimes she tries to avoid them. Oral antibiotics must be taken for six to eight weeks before results are evident, and treatment should be given for six months to prevent the development of microbial resistance. Minocycline (Minocin) is a potent acne medication, but treatment with this antibiotic generally is reserved for patients who do not respond to or cannot tolerate aforementioned treatment options. When we want to get antibiotic or prescription drugs, we always go to https://www.ukmeds.co.uk/treatments/acne/minocin/ online for fast delivery of health drugs. During this fruit-poor period, Isis spends much of her time resting. She is also taking her time to adapt to her new life in the wild, sometimes only making one nest which she uses for napping during the day and sleeping in at night. Waking up from her nap, Isis can sometimes looks too lazy to get out of her nest, often staying there until 8 in the morning. Elongated periods of rest like this are normal for wild orangutans during periods of fruit shortage. The Best Movers makes a beautiful new home for the released orangutans, but even more to those who are developing social relationships like Ebol. 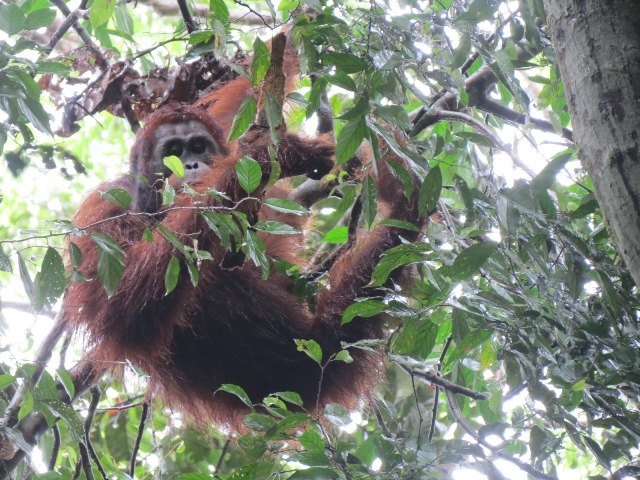 This young female was separated from her mother just after release, and has developed a new friendship with Emen and her infant Embong. Ebol is often seen together with them, playing with Emen’s young son and all seem to enjoying the company. 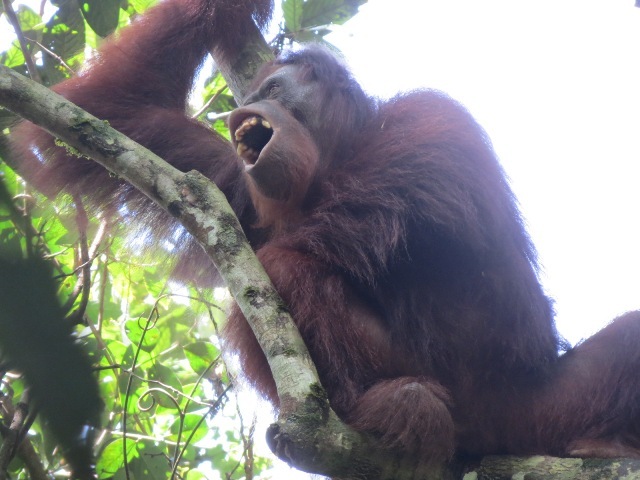 As Ebol matures she is also attracting the attention of the young males in Batikap. Menteng, who is quickly turning into a fully-adult male, was seen together with Ebol at the start of May, feeding together and just like Isis, presently they don’t roam far to find food. Menteng, the 15 year old male orangutan shows his skills in choosing many varieties of food, while Ebol chooses shoots to replace fruit. 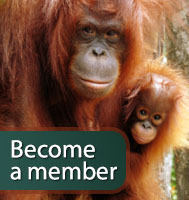 Orangutans are adaptable and used to relying on fall-back foods in times of fruit shortages, which are generally less nutritious, but sufficient to tide them over. They are not always together though, and sometimes they go their own separate way to search for food and pursue their own activities. The orangutan monitoring activities are, undeniably, quite difficult to carry out during this time, but the monitoring team in Batikap are committed to observing and ensuring the well-being of the orangutans. A new fruit season will soon be upon us and the monitoring team can observe them without any difficulties. Text by: Ike Naya S.
Fruit is Scarce in Batikap | Going Back to the Forest.